Use investigative reports to analyze Internet activity in an interactive way. When you first open the Reporting > Investigative Reports page in the Web module of the Forcepoint Security Manager, a high-level summary report is displayed. Risk classes are groupings of categories used to suggest possible types or levels of vulnerability posed by sites in those categories. You can click Options at the top of the page to change the default time period. Only activity that you are authorized to see is displayed. For self-reporting users, this is information about your own Internet activity. For many delegated administrators, this is information about your managed clients. For some administrators, this is information for your entire organization. Use this overview as a quick check for areas of potential concern. Are there a high number of Security Risk or Legal Liability requests? Does the overall amount of activity seem appropriate? If the high-level summary shows areas of potential concern, Drill down to find details. Use standard reports to get a targeted view of monitored Internet activity. 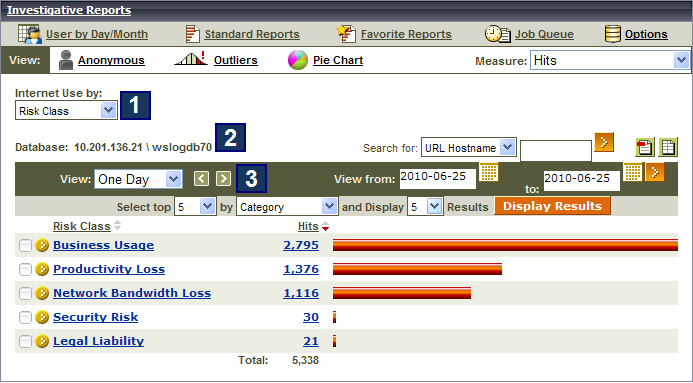 Customize summary reports or Customize detail reports to create a report that better reflects your needs. For quick reference explaining the types of data that can be included in investigative reports, see What information can I see in a report?. Create Favorite reports to minimize the work required to get to the data you need, and optionally schedule them to run at regular intervals.